Sanford Koufax (/ˈkoʊfæks/; born Sanford Braun; December 30, 1935) is a former American Major League Baseball (MLB) left-handed pitcher. 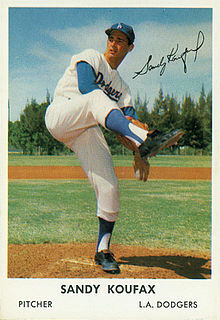 He pitched 12 seasons for the Brooklyn/Los Angeles Dodgers, from 1955 to 1966. Koufax, at age 36 in 1972, became the youngest player ever elected to the Baseball Hall of Fame. He has been hailed as one of the greatest pitchers in baseball history. Koufax was the first major league pitcher to pitch four no-hitters and the eighth pitcher to pitch a perfect game in baseball history. Despite his comparatively short career, Koufax's 2,396 career strikeouts ranked 7th in history as of his retirement, at the time trailing only Warren Spahn (2,583) among left-handers. Koufax, Randy Johnson, Pedro Martínez, and Nolan Ryan are the only four pitchers elected to the Hall of Fame who had more strikeouts than innings pitched. Koufax is also remembered as one of the outstanding Jewish athletes in American sports. His decision not to pitch Game 1 of the 1965 World Series because it fell on Yom Kippur garnered national attention as an example of conflict between professional pressures and personal beliefs. 1954 University of Cincinnati baseball team photo with Sandy Koufax (top row, 5th from the left). Koufax was born in Brooklyn, New York, to a Jewish family, and raised in Borough Park. His parents, Evelyn (née Lichtenstein) and Jack Braun, divorced when he was three years old. His mother was remarried when he was nine, to Irving Koufax. Shortly after his mother's remarriage, the family moved to the Long Island suburb of Rockville Centre. Before tenth grade, Koufax's family moved back to the Bensonhurst section of Brooklyn. Koufax attended Brooklyn's Lafayette High School, where he was better known for basketball than for baseball. At the time, school sports were not available because New York's teachers were refusing to supervise extracurricular activities without monetary compensation. As an alternative, Koufax started playing basketball for the Edith and Carl Marks Jewish Community House of Bensonhurst local community center team. Eventually, Lafayette had a basketball team; Koufax became team captain in his senior year, and ranked second in his division in scoring, with 165 points in 10 games. In 1951, at the age of 15, Koufax also joined a local youth baseball league known as the "Ice Cream League". He started out as a left-handed catcher before moving to first base. While playing first base for Lafayette High School's baseball team with teammate and friend Fred Wilpon, he was spotted by Milt Laurie, the father of two Lafayette teammates and a baseball coach. Laurie recognized that Koufax might be able to pitch, and recruited the 17-year-old Koufax to pitch for the Coney Island Sports League's Parkviews. Koufax attended the University of Cincinnati and was a walk-on on the freshman basketball team, a complete unknown to coach Ed Jucker. He later earned a partial scholarship. In spring 1954, he made the college baseball varsity team. In his only season, Koufax went 3–1 with a 2.81 ERA, 51 strikeouts and 30 walks in 32 innings. Bill Zinser, a scout for the Brooklyn Dodgers, sent the Dodgers front office a glowing report that apparently was filed and forgotten. After trying out with the New York Giants at the Polo Grounds, Koufax did the same for the Pittsburgh Pirates at Forbes Field. During his Pirates tryout, Koufax's fastball broke the thumb of Sam Narron, the team's bullpen coach. Branch Rickey, then the general manager of the Pirates, told his scout Clyde Sukeforth that Koufax had the "greatest arm [he had] ever seen". The Pirates, however, failed to offer Koufax a contract until after he was already committed to the Dodgers. Dodgers scout Al Campanis heard about Koufax from a local sporting goods store owner. After seeing Koufax pitch for Lafayette, Campanis invited him to an Ebbets Field tryout. With Dodgers manager Walter Alston and scouting director Fresco Thompson watching, Campanis assumed the hitter's stance while Koufax started throwing. Campanis later said, "There are two times in my life the hair on my arms has stood up: The first time I saw the ceiling of the Sistine Chapel and the second time, I saw Sandy Koufax throw a fastball." The Dodgers signed Koufax for a $6,000 ($56,000 today) salary, with a $14,000 ($131,000 today) signing bonus. Koufax planned to use the money as tuition to finish his university education, if his baseball career failed. Because Koufax's signing bonus was greater than $4,000 ($37,000 today), he was known as a bonus baby. This forced the Dodgers to keep him on the major league roster for at least two years before he could be sent to the minors. To make room for him, the Dodgers optioned their future Hall of Fame manager, Tommy Lasorda, to the Montreal Royals of the International League. Lasorda would later joke that it took Koufax to keep him off the Dodger pitching staff. Koufax made his major league debut on June 24, 1955 against the Milwaukee Braves, with the Dodgers trailing 7–1 in the fifth inning. Johnny Logan, the first batter Koufax faced, hit a bloop single. Eddie Mathews bunted, and Koufax threw the ball into center field. He then walked Hank Aaron on four pitches to load the bases, but struck out Bobby Thomson on a 3-2 fastball—an outcome Koufax later came to view as "probably the worst thing that could have happened to me," leading, as it did, to five seasons spent "trying to get out of trouble by throwing harder and harder and harder." A ticket from the game where Koufax earned his first career win. Koufax's first start was on July 6. He lasted only ​4 2⁄3 innings, giving up eight walks. He did not start again for almost two months, but on August 27, Koufax threw a two-hit, 7–0 complete game shutout against the Cincinnati Reds for his first major league win. Koufax threw ​41 2⁄3 innings in 12 appearances that season, striking out 30 batters and walking 28. He had two wins in 1955, which were both shutouts. The year 1956 was not very different from 1955 for Koufax. Despite the blazing speed of his fastball, Koufax continued to struggle with his control. He saw little work, pitching only 58.7 innings with a 4.91 ERA, 29 walks and 30 strikeouts. When Koufax allowed baserunners, he was rarely permitted to finish the inning. Teammate Joe Pignatano said that, as soon as Koufax threw a couple of balls in a row, Alston would signal for a replacement to start warming up in the bullpen. Jackie Robinson, in his final season, clashed with Alston on Koufax's usage. Robinson saw that Koufax was talented and had flashes of brilliance, and objected to Koufax being benched for weeks at a time. To prepare for the 1957 season, the Dodgers sent Koufax to Puerto Rico to play winter ball. On May 15, the restriction on sending Koufax down to the minors was lifted. Alston gave him a chance to justify his place on the major league roster by giving him the next day's start. Facing the Chicago Cubs at Wrigley Field, Koufax struck out 13 while pitching his first complete game in almost two years. For the first time in his career, he was in the starting rotation, but only for two weeks. Despite winning three of his next five with a 2.90 ERA, Koufax did not get another start for 45 days. In that start, he struck out 11 in seven innings, but got a no-decision. On September 29, Koufax became the last man to pitch for the Brooklyn Dodgers before their move to Los Angeles, by throwing an inning of relief in the final game of the season. In early 1960, Koufax asked Dodgers GM Buzzie Bavasi to trade him because he was not getting enough playing time. By the end of 1960, after going 8–13, Koufax was thinking about quitting baseball to devote himself to an electronics business that he had invested in. After the last game of the season, he threw his gloves and spikes into the trash. Nobe Kawano, the clubhouse supervisor, retrieved the equipment to return to Koufax the following year (or to somebody else if Koufax did not return to play). Koufax tried one more year of baseball and showed up for the 1961 season in better condition than he had in previous years. Years later he recalled, "That winter was when I really started working out. I started running more. I decided I was really going to find out how good I can be." During spring training, Dodger scout Kenny Myers discovered a hitch in Koufax's windup: he would rear back so far that his vision was obstructed and he could not see the target. A day later, Koufax was pitching for the "B team" in Orlando. Teammate Ed Palmquist missed the flight, so Koufax was told he would need to pitch at least seven innings. In the first inning, Koufax walked the bases loaded on 12 straight pitches. Catcher Norm Sherry advised Koufax to throw slightly less hard in order to improve his control. The advice worked, as Koufax struck out the side, going on to pitch seven no-hit innings. It was the beginning of Koufax's breakout season. Posting an 18–13 record for the Dodgers in 1961, Koufax led the league with 269 strikeouts, breaking Christy Mathewson's 58-year-old NL mark of 267. Koufax was selected as an All-Star for the first time and made two All-Star Game appearances; MLB held two All-Star games from 1959 through 1962. He faced only one batter in the 9th inning in the first game, giving up a hit to Al Kaline and he pitched two scoreless innings in the second game. In 1962, the Dodgers moved from the Los Angeles Coliseum, which had a 250-foot left field line, to pitcher-friendly Dodger Stadium. The new park had a large foul territory and a comparatively poor hitting background. Koufax was an immediate beneficiary of the change, lowering his home ERA from 4.29 to 1.75. On June 30 against the expansion New York Mets, Koufax threw his first no-hitter. In the first inning of that game, Koufax struck out three batters on nine pitches to become the sixth National League pitcher and the 11th pitcher in Major League history to accomplish a nine-pitch/three-strikeout half-inning, also called an immaculate inning. With the no-hitter, a 4-2 record, 73 strikeouts, and a 1.23 ERA for June, he was named Major League Baseball Player of the Month Award. It would be the only time in his career he earned this distinction. Koufax had his strong season despite an injured pitching hand. While batting in April, Koufax had been jammed by a pitch from Earl Francis. A numbness developed in Koufax's index finger on his left hand, and the finger became cold and white. Koufax was pitching better than ever, however, so he ignored the problem, hoping that the condition would clear up. By July, though, his entire hand was becoming numb and he was unable to complete some games. In a start in Cincinnati, his finger split open after one inning. A vascular specialist determined that Koufax had a crushed artery in his palm. Ten days of experimental medicine successfully reopened the artery. Koufax finally was able to pitch again in September, when the team was locked in a tight pennant race with the Giants. But after the long layoff, Koufax was ineffective in three appearances as the Giants caught the Dodgers at the end of the regular season, forcing a three-game playoff. On May 11, Koufax no-hit the San Francisco Giants 8-0, besting future Hall of Fame pitcher Juan Marichal—himself a no-hit pitcher a month later, on June 15. Koufax carried a perfect game into the eighth inning against the powerful Giants lineup, including future Hall of Famers Willie Mays, Willie McCovey, and Orlando Cepeda. He walked Ed Bailey on a 3-and-2 pitch in the 8th, and pinch-hitter McCovey on four pitches in the 9th, before closing out the game. As the Dodgers won the pennant, Koufax won the pitchers' Triple Crown, leading the league in wins (25), strikeouts (306) and ERA (1.88). Koufax threw 11 shutouts, setting a new post-1900 record for shutouts by a left-handed pitcher that stands to this day (the previous record of 10 shutouts had been held by Carl Hubbell for 30 years). Only Bob Gibson, a right-hander, has thrown more shutouts (13) since, and that was in 1968, "the year of the pitcher." Koufax won the NL MVP Award and the Hickok Belt, and was the first-ever unanimous selection for the Cy Young Award. Facing the Yankees in the 1963 World Series, Koufax beat Whitey Ford 5–2 in Game 1 and struck out 15 batters — including the first 5, breaking Carl Erskine's decade-old record of 14 (Gibson would break Koufax's record by striking out 17 Detroit Tigers in the 1968 World Series opener). After seeing Koufax's Game 1 performance, Yogi Berra said, "I can see how he won 25 games. What I don't understand is how he lost five," to which Maury Wills responded, "He didn't. We lost them for him." In Game 4, Koufax completed the Dodgers' series sweep with a 2–1 victory over Ford, clinching the Series MVP Award for his performance. Koufax's 1964 season started with great expectations. On April 18, he struck out three batters on nine pitches in the third inning of a 3–0 loss to the Cincinnati Reds, becoming the only National League pitcher to have two nine-pitch/three-strikeout half-innings. On April 22, however, "he felt something let go in his arm." Koufax ended up getting three cortisone shots for his sore elbow, and missed three starts. On June 4, playing at Connie Mack Stadium against the Phillies, Koufax walked Richie Allen on a very close full-count pitch in the fourth inning. Allen, who was thrown out trying to steal second, was the only Phillie to reach base that day. With his third no-hitter in three years, Koufax became only the second pitcher of the modern era (after Bob Feller) to pitch three no-hitters. On September 9, 1965, Koufax became the sixth pitcher of the modern era, and eighth overall, to throw a perfect game, the first by a left-hander since 1880. The game was Koufax's fourth no-hitter, setting a Major League record (subsequently broken by Nolan Ryan). Koufax struck out 14 batters, at the time the most recorded in a perfect game (now tied by Matt Cain). The game also featured a quality performance by the opposing pitcher, Bob Hendley of the Cubs. Hendley pitched a one-hitter and allowed only two batters to reach base. Both pitchers had no-hitters intact until the seventh inning. Koufax garnered headlines by declining to pitch Game 1 of the World Series because of his observance of the Jewish religious holiday of Yom Kippur. This decision garnered national attention as an example of conflict between professional pressures and personal religious beliefs. Don Drysdale pitched the opener, but was hit hard by the Minnesota Twins. In Game 2, Koufax pitched six innings, giving up two runs, and the Twins won the Game 5–1 and took an early 2–0 lead in the series. The Dodgers fought back in Games 3 and 4, with wins by Claude Osteen and Drysdale. With the Series tied at 2 to 2, Koufax pitched a complete game shutout in Game 5 for a 3–2 Dodgers lead as the Series returned to Minnesota's Metropolitan Stadium for Game 6. The Twins won Game 6 to force a seventh game. Starting Game 7 on just two days of rest, Koufax pitched through fatigue and arthritic pain. Despite giving up on his curveball early in the game after failing to get it over for strikes in the first two innings and pitching the rest of the game relying almost entirely on fastballs, he threw a three-hit shutout to clinch the Series. The performance earned him his second World Series MVP award. Koufax also won the Hickok Belt a second time, the first time anyone had won the belt more than once. He was awarded Sports Illustrated magazine's Sportsman of the Year award. Before the 1966 season began, Koufax and Drysdale met separately with Dodger GM Buzzie Bavasi to negotiate their contracts for the upcoming year. After Koufax's meeting, he met Drysdale for dinner and complained that Bavasi was using Drysdale against him in the negotiations, asking, "How come you want that much when Drysdale only wants this much?" Drysdale responded that Bavasi did the same thing with him, using Koufax against him. Drysdale's first wife, Ginger Drysdale, suggested that they negotiate together to get what they wanted. They demanded $1 million ($7,720,000 today), divided equally over the next three years, or $167,000 ($1,290,000 today) each for each of the next three seasons. Both players were represented by an entertainment lawyer, J. William Hayes, which was unusual during an era when players were not represented by agents. At the time, Willie Mays was Major League Baseball's highest paid player at $125,000 ($965,000 today) per year and multi-year contracts were very unusual. Koufax and Drysdale did not report to spring training in February. Instead, they both signed to appear in the movie Warning Shot, starring David Janssen. Drysdale was to play a TV commentator and Koufax a detective. Meanwhile, the Dodgers waged a public relations battle against them. After four weeks, Koufax gave Drysdale the go-ahead to negotiate new deals for both of them. Koufax ended up getting $125,000 and Drysdale $110,000 ($849,000 today). They rejoined the team in the last week of spring training. In April 1966, Kerlan told Koufax it was time to retire and that his arm could not take another season. Koufax kept Kerlan's advice to himself and went out every fourth day to pitch. He ended up pitching 323 innings, a 27–9 record, and a 1.73 ERA. Since then, no left-hander has had more wins, nor a lower ERA, in a season (Phillies pitcher Steve Carlton did match the 27-win mark in 1972). In the final game of the regular season, the Dodgers had to beat the Phillies to win the pennant. In the second game of a doubleheader, Koufax faced Jim Bunning for the second time that season, in a match-up between perfect game winners. Koufax, on two days rest, pitched a complete game, 6–3 victory to clinch the pennant. He started 41 games (for the second year in a row); only two left-handers started as many games in any season over the ensuing years through 2016. The Dodgers went on to face the Baltimore Orioles in the World Series, and Game 2 marked Koufax's third start in eight days. He pitched well enough—Baltimore first baseman Boog Powell told Koufax's biographer, Jane Leavy, "He might have been hurtin' but he was bringin'"—but three errors by Dodger center fielder Willie Davis in the fifth inning produced three unearned runs. Baltimore's twenty-year-old Jim Palmer pitched a four-hitter and the Orioles won 6–0. Alston lifted Koufax at the end of the sixth inning, with the idea of getting him extra rest before a potential fifth game. It never happened; the Dodgers were swept in four, not scoring a single run in the last three. Less than six weeks later, Koufax announced his retirement due to his arthritic condition on Friday, November 18, 1966. In his 12-season career, Koufax had a 165–87 record with a 2.76 ERA, 2,396 strikeouts, 137 complete games, and 40 shutouts. He was the first pitcher to average fewer than seven hits allowed per nine innings pitched in his career (6.79) and to strike out more than nine batters (9.28) per nine innings pitched in his career. He also became the 2nd pitcher in baseball history to have two games with 18 or more strikeouts, and the first to have eight games with 15 or more strikeouts. In his last ten seasons, from 1957 to 1966, batters hit .203 against Koufax, with a .271 on-base percentage and a .315 slugging average. Koufax's postseason record is impressive: a 4–3 won-lost record with a 0.95 earned run average, in four World Series. He is on the very short list of pitchers who retired with more career strikeouts than innings pitched. Koufax was selected as an All-Star for six consecutive seasons and made seven out of eight All-Star Game appearances those seasons (not selected for 2nd All-Star Game in 1962). He pitched 6​1⁄3 innings in four All-Star games including being the starting pitcher for 3 innings in the 1966 All-Star Game. Koufax was the first pitcher to win multiple Cy Young Awards, as well as the first pitcher to win a Cy Young Award by a unanimous vote. He is also the only pitcher to win three Cy Young Awards in the era in which the award was presented to one pitcher across the board, rather than one in each major league, and one of three Dodgers pitchers to win the one-across-the-board Cy Young Award. (The others were Don Newcombe, the first Cy Young winner in 1956, and Don Drysdale in 1962.) Each of Koufax's three Cy Young Awards were by unanimous vote. Koufax and Juan Marichal are the only two pitchers in the post-war era (1946-date) to have more than one 25-win season, with each pitcher recording three. Among NL pitchers with at least 2,000 innings pitched who have debuted since 1913 and have already retired, he has the highest career winning percentage (.655) and had the lowest career ERA (2.76) until surpassed by Tom Seaver, whose NL career mark is 2.73. While Seaver ended his career with an overall career ERA of 2.86, this included three seasons in the American League. Seaver passed Koufax's mark in 1974 when he ended the season with more than 2,000 NL innings and an ERA of 2.47. Among retired pitchers, Koufax is currently second on the list of overall career ERA in the live-ball era, surpassed only by Whitey Ford (2.75). However, among active pitchers, fellow Dodger Clayton Kershaw has a 2.39 ERA in over 2,000 innings pitched through the end of the 2018 season. Kershaw also has a higher winning percentage, .689 through the end of the 2018 season. Through 2010, among Jewish pitchers, he was first all-time in career strikeouts (ahead of Ken Holtzman), second in wins (behind Holtzman) and ERA (behind Barney Pelty), and seventh in games pitched (behind Alan Levine) among Jewish major league baseball players. "I knew every pitch he was going to throw and still I couldn't hit him." Whereas many pitchers throw with a three-quarter or sidearm motion, Koufax threw with a pronounced over-the-top arm action. This may have increased his velocity, but reduced the lateral movement on his pitches, especially movement away from left-handed hitters. Most of his velocity came from his strong legs and back, combined with a high kicking wind-up and long forward stretch toward the plate. Throughout his career, Koufax relied mostly on two pitches. His four-seam fastball gave batters the impression of rising as it approached them, due to underspin. It not only appeared to move very late but also might move two or three distinct times. His overhand curveball, spun with the middle finger, dropped vertically 12 to 24 inches due to his arm action. Rob Neyer called it the best curve of all time. He also occasionally threw a changeup and a forkball. Sandy Koufax's number 32 was retired by the Los Angeles Dodgers in 1972. In 1967, he signed a 10-year contract with NBC for US$1 million ($7,500,000 today) to be a broadcaster on the Saturday Game of the Week. He quit after six years, just prior to the start of the 1973 season. Koufax married Anne Widmark, daughter of movie star Richard Widmark, in 1969; the couple was divorced in 1982. His second marriage, to Kimberly Francis, a personal trainer, lasted from 1985 to 1998. Koufax is currently married to Jane Purucker Clarke. He has no biological children. In his first year of eligibility in 1972, Koufax was elected to the Baseball Hall of Fame, just weeks after his 36th birthday. His election made him the Hall's youngest member ever elected, five months younger than Lou Gehrig upon his election in 1939, though because the 1972 induction ceremony was nearly eight months after the election, Koufax's age at induction was slightly higher than Gehrig's, making Gehrig the youngest player ever inducted. On June 4 of that same year, Koufax's uniform number 32 was retired alongside those of Dodger greats Roy Campanella (39) and Jackie Robinson (42). The Dodgers hired Koufax to be a minor league pitching coach in 1979. He resigned in 1990, saying he was not earning his keep, but most observers blamed it on his uneasy relationship with manager Tommy Lasorda. Koufax returned to the Dodger organization in 2004 when the Dodgers were sold to Frank McCourt. In 1999, The Sporting News placed Koufax at number 26 on its list of "Baseball's 100 Greatest Players". That same year, he was named as one of the 30 players on the Major League Baseball All-Century Team. Although he rarely makes public appearances, he went to Turner Field in Atlanta for the introduction ceremony before Game 2 of the 1999 World Series. Koufax threw out a ceremonial first pitch at opening day 2008 at Dodger Stadium, to help commemorate the Dodgers' 50th Anniversary in Los Angeles. 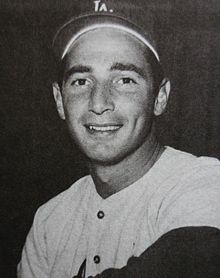 Koufax was the final player chosen in the inaugural Israel Baseball League draft in April 2007. Koufax, 71, was picked by the Modi'in Miracle. "His selection is a tribute to the esteem with which he is held by everyone associated with this league", said Art Shamsky, who managed the Miracle. "It's been 41 years between starts for him. If he's rested and ready to take the mound again, we want him on our team." Koufax declined to join the Miracle. On January 23, 2013 the Dodgers hired Koufax as a Special Advisor to team Chairman Mark Walter. Koufax worked with the pitchers during spring training and will consult during the season. On April 1, 2013, Koufax threw out the first pitch during ceremonies at Dodger Stadium. On July 14, 2015, before the 2015 MLB All-Star Game in Cincinnati, Koufax was introduced as one of the four best living players (as selected by the fans of major league baseball), along with Willie Mays, Hank Aaron and Johnny Bench. He threw the ceremonial first pitch to Bench from in front of the base of the mound. On November 1, 2017, before game 7 of the 2017 World Series between the Dodgers and Houston Astros at Dodger Stadium, Koufax threw the ceremonial first pitch along with former teammate Don Newcombe. "This is a pretty fancy ... pretty distinguished group", he said of the invited guests, which included members of the House and Senate, two justices of the Supreme Court, Olympic athletes, entrepreneurs, Rabbinical scholars, "and Sandy Koufax". The mention of his name brought the biggest cheer at the event. ^ a b "Retired Numbers – Kirby Puckett". minnesota.twins.mlb.com. Retrieved February 10, 2007. ^ a b c d e f "Sandy Koufax Statistics". www.baseball-reference.com. Retrieved February 14, 2007. ^ "1963 Major League Leaders". Baseball-Reference. Archived from the original on February 11, 2007. Retrieved February 17, 2007. ^ "1965 Major League Leaders". Baseball-Reference. Archived from the original on December 15, 2006. Retrieved February 17, 2007. ^ "1966 Major League Leaders". Baseball-Reference. Archived from the original on October 15, 2007. Retrieved February 17, 2007. ^ a b Solomvits, Sandor. "Yom Kippur and Sandy Koufax". JewishSports.com. Archived from the original on October 18, 2006. Retrieved August 2, 2010. ^ a b Brody, Seymour. "Koufax Biography". jewishvirtuallibrary.org. Retrieved November 15, 2006. ^ a b "Koufax Biography". www.hickoksports.com. Archived from the original on January 11, 2013. Retrieved November 15, 2006. ^ Koufax and Linn, pp. 19–22. ^ Koufax and Linn, pp. 22–28; Leavy, pp. 37–40. ^ "Sandy Koufax could testify at trial". ESPN. Associated Press. March 13, 2012. Retrieved January 16, 2013. ^ Koufax and Linn, pp. 32–39. ^ Koufax and Linn, pp. 43–44. ^ Dyer, Mike (May 4, 2014). "Sandy Koufax's season with UC Bearcats remembered". The Cincinnati Enquirer. Retrieved June 20, 2016. ^ Koufax and Linn, pp. 44–45. ^ Koufax and Linn, pp. 56–57. ^ Koufax and Linn, pp. 70–74. ^ Dalin, David G. (September 27, 2011). "Why we can't forget Sandy Koufax". CBS News. Retrieved January 12, 2017. ^ Koufax and Linn, pp. 42, 75–94. ^ Koufax and Linn, pp. 95–97. ^ Biederman, Lester J. (May 16, 1966). "Koufax Recalls His Wild Start At Forbes Field". Pittsburgh Press. p. 35. Retrieved November 18, 2016. ^ a b Leavy, p. 74. ^ Koufax and Linn, pp. 3, 105–107. ^ Koufax and Linn, pp. 117–124; Leavy, pp. 87–90. ^ Koufax and Linn, pp. 125–138; Leavy, pp. 90–92; "Box score and play by play". Retrosheet. Retrieved February 17, 2007. ^ Koufax and Linn, pp. 139–141; "Box score and play by play". Retrosheet. Retrieved February 17, 2007. ^ Koufax and Linn, pp. 142–147; Leavy, pp. 93–95. ^ Koufax and Linn, pp. 153–155; Leavy, pp. 102–103. ^ Koufax and Linn, pp. 157–159; Leavy, pp. 115–116. ^ "First game box score and play by play". Retrosheet. Retrieved February 17, 2007. "Second game box score and play by play". Retrosheet. Retrieved February 17, 2007. ^ James, p. 233; Koufax and Linn, pp. 127–128; Leavy, p. 116. ^ Koufax and Linn, pp. 167–169; Leavy, p. 119; "Player of the Month Award". Baseball Almanac. Retrieved February 17, 2007. ^ a b "9-Pitches, 9-Strikes, Side Retired". Baseball Almanac. Retrieved February 17, 2007. ^ "Major League Baseball Players of the Month". Baseball-Reference. Retrieved December 6, 2016. ^ Koufax and Linn, pp. 165–176; Leavy, pp. 120–121. ^ Koufax and Linn, pp. 176–177; Neyer, pp. 111–118. ^ "The Strike Zone: A Chronological Examination of the Official Rules by Baseball Almanac". Baseball-almanac.com. Retrieved January 31, 2011. ^ "1962 National League Team Statistics and Standings". Baseball-Reference. Retrieved June 20, 2010. "1963 National League Team Statistics and Standings". Baseball-Reference. Retrieved June 20, 2010. ^ "Baseball Encyclopedia of MLB Players". Baseball-Reference.com. Retrieved January 31, 2011. ^ Koufax and Linn, pp. 181–183; Leavy, pp. 122–123. ^ The Baseball Chronicle, p. 344. ^ "Single-Season Leaders & Records for Shutouts". Baseball-Reference. Retrieved November 1, 2017. ^ "1963 National League Statistics and Awards". Baseball-Reference. Archived from the original on February 6, 2007. Retrieved February 18, 2007. ^ a b "The Hickok Belt". HickokSports.com. Archived from the original on February 23, 2002. Retrieved February 18, 2007. ^ "Sandy Koufax Biography". ESPN SportsCentury. Retrieved May 24, 2005. ^ Ronald N. Neff, www.thornwalker.com (March 29, 2007). "Joe Sobran – My Other Sandy (ASCII version)". Sobran.com. Retrieved August 30, 2009. ^ Koufax and Linn, pp. 184–216; Leavy, pp. 132–143; "World Series MVP Award". Baseball Almanac. Retrieved February 18, 2007. ^ "1963 World Series box scores and play by play". Retrosheet. Retrieved February 18, 2007. ^ Koufax and Linn, pp. 219–221; Leavy, pp. 151–153. ^ Koufax and Linn, pp. 222–228; Leavy, pp. 155–157. ^ Koufax and Linn, pp. 228–239; Leavy, pp. 157–160. ^ Koufax and Linn, pp. 234–240; Leavy, p. 160; "Single-Season Leaders for Strikeouts". Baseball-Reference. Retrieved February 18, 2007. ^ Eagle, Ed (June 13, 2018). "All-time perfect games in MLB history". Major League Baseball. Retrieved December 31, 2018. ^ a b Clair, Michael (September 9, 2014). "On this day 49 years ago, Sandy Koufax threw a perfect game ... in one hour and 43 minutes". Major League Baseball. Retrieved December 31, 2018. ^ a b "Sandy Koufax". www.baseballlibrary.com. Archived from the original on February 2, 2007. Retrieved February 15, 2007. ^ Attiyeh, Mike. "The five best pitching duels ever". BaseballGuru.com. Archived from the original on February 14, 2007. Retrieved February 18, 2007. "Box score and play by play". Retrosheet. Retrieved February 18, 2007. ^ Koufax and Linn, pp. 256–268; Leavy, pp. 169–195; "1965 World Series box scores and play by play". Retrosheet. Retrieved February 18, 2007. ^ "Sic Transit Tradition". Time. April 8, 1966. Retrieved April 30, 2008. ^ "Double Play". Time. Time, Inc. March 25, 1966. Retrieved April 30, 2008. ^ "July 27 box score". Baseball-Reference.com. July 27, 1966. Retrieved January 31, 2011. ^ a b "Baltimore makes it two straight as Dodgers defense comes apart". Spokesman-Review. (Spokane, Washington). Associated Press. October 7, 1966. p. 18. ^ "Box score and play by play". Retrosheet. Retrieved February 18, 2007. ^ "It's Baltimore in four straight". Spokesman-Review. (Spokane, Washington). Associated Press. October 10, 1966. p. 8. ^ Myers, Bob (November 19, 1966). "Elbow too much - Sandy Koufax quitting baseball". Spokesman-Review. (Spokane, Washington). Associated Press. p. 10. ^ "No Hitter Records". Baseball Almanac. Retrieved February 17, 2007. "Progressive Leaders for Hits Allowed/9IP". Baseball-Reference. Archived from the original on October 11, 2007. Retrieved February 17, 2007. "Progressive Leaders for Strikeouts/9IP". Baseball-Reference. Archived from the original on October 1, 2007. Retrieved February 17, 2007. ^ The play-by-play data from which these averages were calculated are available starting in 1957. See "Career Leaders & Records for Earned Run Average". Baseball-Reference. Retrieved January 16, 2013. ^ "MVP and Cy Young Awards". www.baseball-reference.com. Retrieved February 14, 2007. ^ "Career Pitching Leaders". Career Leaders. Jewish Major Leaguers. Retrieved February 10, 2011. ^ Koufax and Linn, p. 153; Leavy, p. 24. ^ a b Neyer & James (2004), pp. 270–271; Leavy, pp. 6–15. ^ Leavy, pp. 7–8, 79. ^ a b Schwartz, Larry. "ESPN Classic – Koufax dominating in '65 Series". espn.com. Retrieved February 18, 2007. ^ "Dodgers Retired Numbers". MLB.com. Retrieved February 15, 2007. ^ "Koufax returns to Dodgertown". Addict Baseball and Football Forum. Archived from the original on December 28, 2004. Retrieved February 15, 2007. ^ "The Sporting News Selects Baseball's 100 Greatest Players". The Sporting News. 223 (17): 16. April 26, 1999. ^ "The All-Century Team". mlb.mlb.com. Retrieved February 15, 2007. "Koufax makes appearance at World Series". CNN/SI. October 24, 1999. Archived from the original on October 6, 2008. Retrieved February 15, 2007. ^ "Baseball Toaster: Humbug Journal : He'll be working on 14,875 days rest". Humbug.baseballtoaster.com. April 24, 2007. Retrieved August 30, 2009. ^ Lloyd de Vries (April 27, 2007). "Koufax Drafted By Israeli Baseball Team". CBS News. Retrieved August 30, 2009. ^ "Dodgers to be joined by Koufax at Spring Training". Los Angeles Dodgers. ^ a b Knoller, Mark (May 27, 2010). ""Obama Honors Jewish Americans at White House Reception", May 27, 2010". Cbsnews.com. Retrieved January 31, 2011. Boswell, Thomas (1982). "Koufax: Passing the Art Along". How Life Imitates the World Series. New York: Penguin Books. pp. 50–55. Faber, Charles F. (2010). Major League Careers Cut Short: Leading Players Gone by 30. Jefferson, North Carolina: McFarland & Company. ISBN 0786462094. Bill James (1988). The Bill James Baseball Abstract 1988. New York: Ballantine Books. ISBN 0-345-35171-1. Roger Kahn (2014). Rickey & Robinson: The True, Untold Story of the Integration of Baseball. New York: Rodale, Inc. ISBN 978-1-62336-297-3. Sandy Koufax; Ed Linn (1966). Koufax. New York: Viking Press. Jane Leavy (2002). Sandy Koufax: A Lefty's Legacy. Perennial. ISBN 0-06-019533-9. William F. McNeil (2001). The Dodgers Encyclopedia. Champaign, Illinois: Sports Publishing Inc. ISBN 1-58261-316-8. Rob Neyer (2006). Rob Neyer's Big Book of Baseball Blunders: A Complete Guide to the Worst Decisions and Stupidest Moments in Baseball History. New York: Simon & Schuster. ISBN 978-0-7432-8491-2. Neyer, Rob; James, Bill (2004). The Neyer/James Guide to Pitchers. New York: Simon & Schuster. ISBN 0-7432-6158-5. The Baseball Chronicle: Year-By-Year History of Major League Baseball. Lincolnwood, Illinois: Publications International, Ltd. 2001. ISBN 978-0-7853-5803-9. "Sandy Koufax Biography". Baseball Hall of Fame. Archived from the original on February 20, 2008. Retrieved June 21, 2008. "Sandy Koufax Career Statistics". Baseball-Reference.com. Retrieved May 24, 2005. "Sandy Koufax Biography". ESPN SportsCentury. Retrieved May 24, 2005. United Press International. "Sandy Koufax Given Hike for Strike-Outs". The Desert Sun. February 4, 1960. Abrams, Al. "Sidelights on Sports: For Lack of an Offer". Pittsburgh Post-Gazette. June 6, 1962. Olsen, Jack. "The Very Best Act in Town". Sports Illustrated. July 29, 1963. "Close-Up: Good Life of Sandy Koufax". Life. August 2, 1963. Associated Press. "Koufax Fans 15, Dodgers Win, 5-2; Dodgers Rout Ford to Take Series Opener". Pittsburgh Post-Gazette. October 3, 1963. pp. 1, 37. United Press International. "Sandy's Finest Hour: Dodgers Break 45s, 1-0". The Desert Sun. July 23, 1964. Leggett, William. "They'd Rather Pitch Than Hit". Sports Illustrated. March 29, 1965. "Koufax on Koufax". Sports Illustrated. December 20, 1965. Associated Press. "Koufax, Drydale Now Actors". Pittsburgh Post-Gazette. March 29, 1966. "New Union's Million-Dollar Pitch". Life. April 1, 1966. Gross, Milton. "Baseball's Fragile Superstars". Popular Science. May 1966. United Press International. "Has Koufax Already Earned His Salary?" La Habra Star. July 1, 1966. Moore, Sam. "Life Baseball Review: Some Series! Koufax Fans The Babe—The 1966 Dream World Series". Life. October 7, 1966. Kahn, Alex (UPI). "'Too Many Shots, Too Many Pills': Baseball Goes On, Minus Sandy". The Desert Sun. November 19, 1966. Linn, Ed. "Sandy Koufax—Best Pitcher of All: Stars Check Into Studio for a Movie". Boys' Life. March 1967. Bavasi, Buzzie. "The Great Holdout". Sports Illustrated. May 15, 1967. Brosnan, Jim. "Baseball's Greatest Pitcher". Boys' Life. February 1979. Verducci, Tom. "The Left Arm of God". Sports Illustrated. July 12, 1999. "Koufax Strikes Out". The Advocate. April 1, 2003. Rosengren, John. "Myth and fact part of legacy from Sandy Koufax's Yom Kippur choice". Sports Illustrated. September 23, 2015. "Sandy Koufax: Pitcher Nonpareil and Perfect Gentleman". In American Jews and America's Game: Voices of a Growing Legacy in Baseball, Larry Ruttman, University of Nebraska Press, 2013, ISBN 978-0-8032-6475-5. This chapter in Ruttman's history discusses Koufax's American, Jewish, baseball, and life experiences from youth to the present.